It’s astonishing how selective memory is, and revisiting old classics often gives me fresh surprises. I’d already seen it on video when I brought a friend to see it in a theater ten or so years ago, and left embarrassed that I hadn’t warned her how jarring the torture scenes near the climax were. With my memory fixated on that, I’d forgotten how shockingly early in the story one of its main characters gets killed, while another is being arrested – and the brilliant reversal when he escapes. I’d also completely forgotten the subplot about the network of escorts who double as informants in exchange for opiates. The best film ever? No arguments here. Maybe because Pope Francis was making headlines that very morning by marrying twenty previously cohabitating couples – seventy years later, but who’s counting? – what struck me most this time around were the characters chosen to articulate the theme. Sure, they had a purity about them, but they were a pregnant couple planning their own shotgun wedding the following day, and this was in 1944. They were good-looking and salt of the earth all at once, but Fellini, Amidei and Rossellini weren’t content with a mere anti-fascist message from a Jack London-esque proletarian hero. They went big, and chose an unmarried couple to express the highest ideals of Christianity itself: endurance, rebirth, and redemption at the end of suffering. Knowing that Rossellini and Ingrid Bergman became notorious a few years later for their extramarital relationship, it’s remarkable that this was already the kind of character he found most expressive. 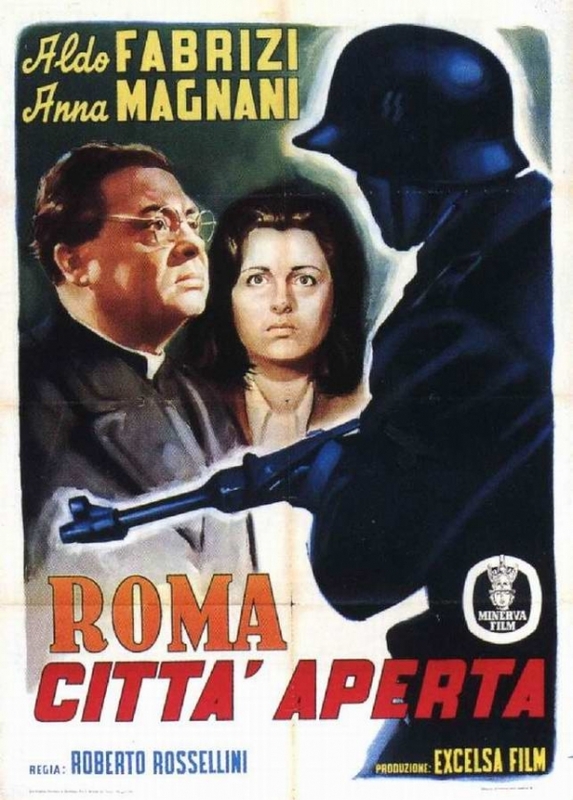 In a future century, when World War II is just “some war” and the secular-religious deck gets shuffled and dealt all over again, Rome, Open City will be remembered as a great Christian work as much as a political one.